In this step, students do a project, a performance assessment, using online resources, and communicate their results to the class. HS LS2-5 Develop a model to illustrate the role of photosynthesis and cellular respiration in the cycling of carbon among the biosphere, atmosphere, hydrosphere, and geosphere. HS.ESS3.D3 Changes in the atmosphere due to human activity have increased carbon dioxide concentrations and thus affect climate. Learning Goal: Students gain a deeper understanding of the relationships between carbon pool and fluxes. The key in the upper right-hand corner lets you distinguish between carbon reservoirs and the processes that move carbon between reservoirs. Remember that reservoirs hold (store) carbon for different time scales - from days to millions of years. The arrows represent carbon moving between reservoirs. Clicking on the topic boxes will give you background information on the processes and the reservoirs. As you click on the reservoirs, make note of the amount of carbon stored in these reservoirs and answer the checking-in question below. Choose one of the many reservoirs that have the amount of carbon stored listed, to start your carbon journey. Hint: Besides the arrows on the diagram, there are clues in the information pop-ups that may tell you where the carbon goes next. Determine a journey your carbon atoms will take, starting from your entry point. There are multiple carbon cycle pathways for you to choose from. For example, a carbon atom released from a tree may go through any one of the terrestrial pathways or one of the ocean pathways or both. Your carbon journey must begin and end at the same reservoir. For example- if your carbon journey started in the atmosphere, it must end in the atmosphere. 3. Student must show a minimum of four steps in their journey. Identify the processes and reservoirs on their chart. Indicate the number of gigatons of carbon stored in the reservoirs on their flow chart, if available. Identify which Earth-system component the reservoirs are in. 5. Tell students to think about how long it takes for these carbon atoms to move from one reservoir to another as they draw arrows between reservoirs. For example, a carbon atom can stay in sedimentary rocks for millions of years before moving to a different carbon reservoir. This would be an example of a "very long, slow time scale." If the information is available, they should indicate a time scale for movement of carbon in their carbon journey. 6. Have students take a picture of their flow chart and submit it for grading (or discussion). Describe the journey through the reservoirs and processes. What processes move the carbon out of one reservoir into another? 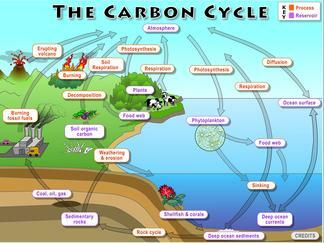 What organisms are involved (if any) and what is their role in the carbon cycle? Does carbon move fastest through the biosphere or the geosphere? What evidence from the pathways supports your answer? Many countries are cutting down forests to make way for agriculture and roads. How might this practice disrupt the carbon cycle? The world's population has passed the 7 billion mark. As the population increases, the need for energy will increase. More coal, gas and oil will be burned to provide that energy. How might this disrupt the global carbon cycle? Why? 7. Place a large sheet of white paper on a wall in the classroom. Have students sketch (or you can do it before class) a sample landscape on it with lithosphere, hydrosphere, and atmosphere labeled. Have students come up to the chart and explain where on the chart their pathway belongs. When all the students have attached their pathways to the larger chart, discuss the resulting chart with them.